Was that too corny? I’m not even sorry. Corn is so versatile in food as well as jokes. I once had an entire corn themed tasting menu at Splendido restaurant and each dish was unique and delicious. Corn can be used in salads, in soups, in pasta, in bread. In season corn is so sweet that it even has a place in desserts. The trick to this crème brulee is to extract as much of the corn flavour as we can into the heavy cream. We do this by first heating the cream (hot extracts better than cold) then by blending (physical disruption). The result is a corn flavoured cream that could be used in any dessert! Here I combined the corn cream with sugar and egg yolks and baked until just set. When you break through that thin caramelized sugar crust, you are met with silky, rich, lightly sweet, corn flavoured custard. Preheat oven to 300F. Prepare 3 crème brulee ramekins (~6.7 fl. oz or 200 mL) by placing them into a larger pan that will serve as a water bath. 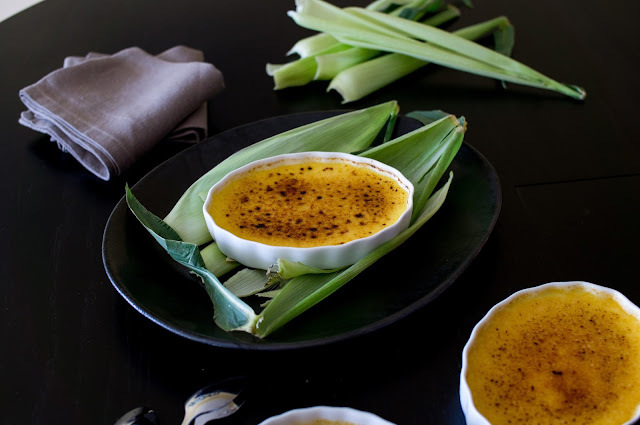 Boil some water in kettle while you prepare the crème brulee. Heat the cream with the corn in a small saucepan until just boiling. Remove from heat, cover, and let sit for 15 minutes. Blend in a blender and strain through layers of cheesecloth to remove the pulp. Fill to 2 cups with more heavy cream, if necessary. Heat again in a small saucepan until just boiling. In the meantime, whisk egg yolks with sugar, salt, and vanilla in a medium bowl until slightly lightened in colour. Whisking constantly, add the heavy cream mixture in a steady stream. Strain into the prepared ramekins filling them about 3/4 full. Place the pan on the middle rack of the oven and pour in hot water from the kettle so that it reaches about 2/3 up the sides of the ramekins. This is so you don’t have to carry a pan full of hot water to the oven and accidentally splash anything. Bake for about 40 minutes or until the crème brulee looks set but still jiggles in the centre. Remove from oven and let cool. Refrigerate for 4 hours or overnight. 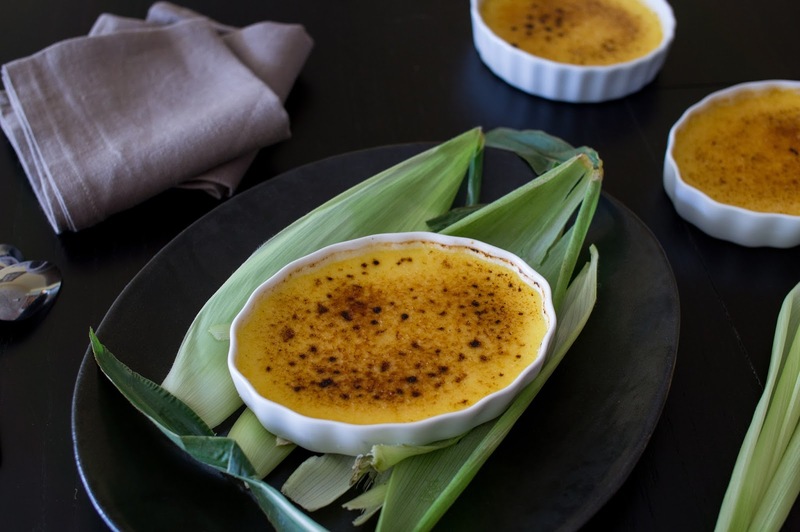 When ready to serve, sprinkle the top of each crème brulee with 1 tbsp of granulated sugar. Shake the ramekin so that the sugar is evenly distributed over the top of the crème brulee. 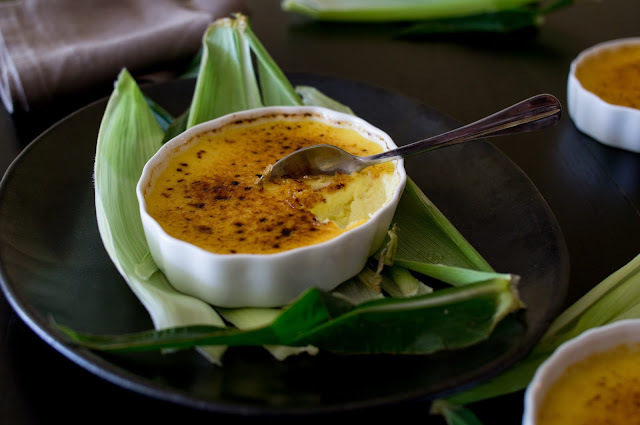 Using a kitchen torch or the broil setting of the oven, brown the sugar on the crème brulee until it is golden-brown and bubbling. If using the oven, make sure to watch closely! What a scrumptious creme brulee! 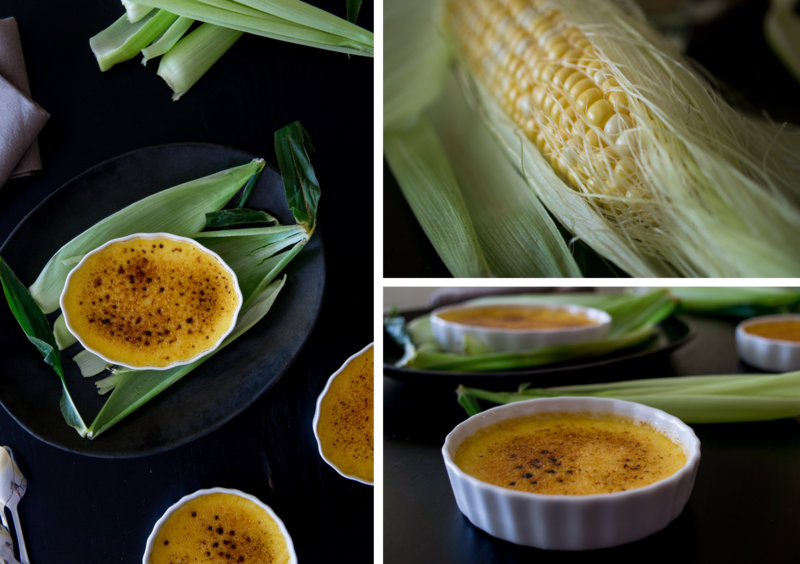 The addition of sweet, seasonal corn makes for a wonderful dessert!